Combine shredded chicken and grilled onion. Set aside. In a large frying pan over medium heat, add 2 tablespoons vegetable oil. Once oil is hot, add green enchilada sauce and 1 cup sour cream. Mix together until combined. Reduce heat to a simmer. Set aside. Over medium heat, fill the bottom of a large pan with 1 inch of vegetable oil. Once heated, fry corn tortillas on each side until slightly bendable. Arrange fried tortillas along bottom of a baking dish, and fill the center of each one with a heaping tablespoon of the chicken mixture. Add a pinch of Monterey Jack cheese and roll each tortilla into a tube. Continue until the entire baking dish is full, lining up and arranging the stuffed tortillas as you go. Take several tablespoons of the creamy green chile sauce and spoon it over the enchiladas. Sprinkle a little more cheese over the top, and bake for 30 minutes. Remove from oven and top with a few dollops of sour cream, to taste. Serve prepared enchiladas on a bed of lettuce. Growing up in East Los Angeles meant that I had a huge selection of Mexican food at my disposal. From flautas to sopas, pozoles, tacos, and enchiladas, I had a huge variety of dishes to choose from. My dearest friend Mari’s family owned a restaurant in East L.A. called La Serenata. They were the pioneers of the gourmet Mexican food movement here in L.A. It was there that I experienced my first plate of enchiladas suizas (Swiss enchiladas). 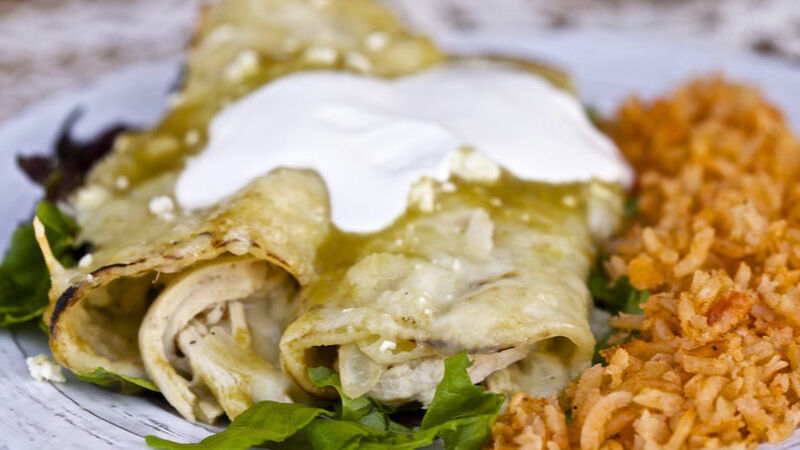 An enchilada suiza is basically a chicken enchilada in a creamy, green chile sauce. It's very simple, but so yummy! I've been making them ever since, and they are now a family favorite!